You won’t get very far on the ukulele without being able to chuck with your strumming hand. It’s actually pretty easy to do but takes a bit of practice to get right. What on earth is chucking? Chucking (sometimes called chunking or just palm muting) is a strumming hand technique that mutes the strings before strumming them to give a percussive sound. 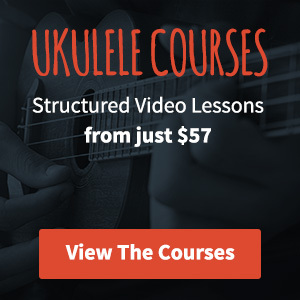 It’s used in a lot of ukulele songs and I’d recommend you get to grips with it just as soon as you’ve mastered a few basic strumming patterns. Before you strum you need to make sure that the fleshy part of your palm is resting on the strings, lightly touching them. This means that you’ll need to get your hand in position just before you strum. Once your palm is in place you then strum as normal with your index finger. The palm is basically damping the strings – the chord is still there but the tone isn’t quite as pronounced and you get more of a click. It’s a really great way to break up a strumming pattern and add a little bit more interest to what you’re playing. Chucks are represented by an X in ukulele tab. So whenever you encounter a section of tab that is marked with Xs you know what to do. So which one is it? Chucking or chunking? I have no idea, I don’t think anyone really knows which is the preferred term – all you need to know is that you will encounter them both and now you know it’s the same thing you don’t need to worry about it. If you want to see an example of chucking, check out my recent video lesson on Drake’s Best I Ever Had. It’s one of those things, really difficult to begin with, then when you get it you can’t quite understand what was so hard.